Inspired by the traditional Moroccan condiment, this roasted red pepper and sun-dried tomato salsa is rounded out with just the right amount of extra virgin olive oil, lemon juice, spices, and sea salt. Serve with flatbread, grilled chicken, olives, and feta cheese for a new twist on nachos. Toss with butter and boiled potatoes or sautéed vegetables. 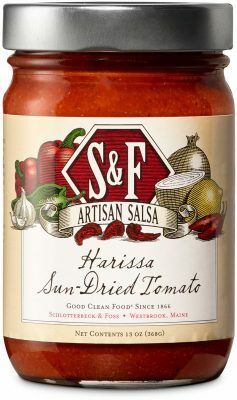 Spoon this aromatic salsa into soups, over rice, or onto scrambled eggs. Red Bell Peppers, Water, Red Jalapenos (Red Jalapenos, Salt, Acetic Acid), Cane Sugar, Onions, Apple Cider Vinegar, Spices, Ancho Chili Powder, Extra Virgin Olive Oil, Sun Dried Tomatoes, Sea Salt, Garlic, Paprika, Chipotle Chili Powder, Lemon Juice Concentrate, Xanthan Gum.